The 70-foot High Falls of the Baptism River has the distinction of being the tallest waterfall in Minnesota. (High Falls of the Pigeon River is higher, but half of it is in Ontario.) 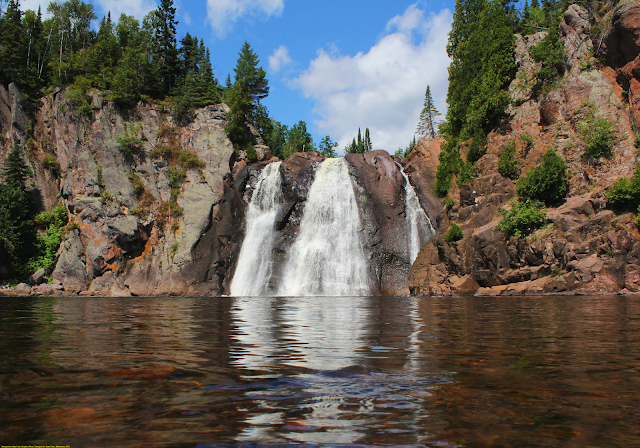 The High Falls of the Baptism River is in Minnesota's Tettegouche State Park. This is the highest waterfall entirely in the state of Minnesota. The High Falls of the Pigeon River on the Minnesota/Ontario border is the only higher fall in the state. The Baptism’s High Falls Trail rises sharply at first and soon intersects the Superior Hiking Trail. There, go right following a path that is well-groomed, though steep in spots. The trail follows the west side of the river, passing through birch forest carpeted in bunchberries and thimbleberries. After about 15 minutes, you’ll arrive at a wooden overlook of High Falls. To your left, 67 wooden steps lead down to another observation platform. The view here is somewhat obscured by vegetation, though, so continue down 49 more steps for a better overview at the river bridge. Cross on the springy suspension bridge and head downstream. A series of boardwalks and short runs of steps going up and down lead to varied views of the falls. One hundred and fifty-seven wooden steps take you to the river and a view looking up at the waterfall. Mist dances like spirits, high into the air. Depending on where you start, the hike to the falls is one mile or three miles round trip. There are a fair amount of stairs. If you take the longer route, you will pass Two Step Falls on your way. Farther upstream the 45 foot Illgen Falls can be found.